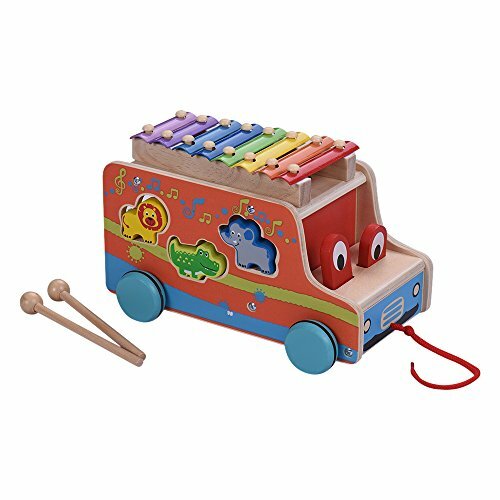 Cute and colorful design: cartoon bus shape with 8 metal keys on the top, surface painted with bright colors, plus 6 cute animal-shaped blocks, children will be willing to play. Easy and fun to play: children can use the included mallets to knock the metal keys to play melodies or simple songs, or or walk around with pulling the car, or put the blocks to corresponding positions of the bus. Educational musical toy: enables children to learn while having fun, cultivating children's coordination ability of hands and eyes; promoting musical sense and animal recognition, etc.